Oil painting on wooden panel 10 ¼ x 8 ¼ inches, 26 x 21 cm.. Contained in its original arch-topped giltwood spandrel, within an ornate gesso frame. Inscribed on the reverse on various labels with the identity of the sitter, its descent within the family, Hodgson's own initialled monogram and wax seal. Joseph Hodgson: Born at Penrith, Cumberland, the son of a Birmingham merchant. He was educated at King Edward VI's Grammar School and was apprenticed to George Freer, who was Surgeon to the Birmingham General Hospital from December, 1793, to the day of his death in December, 1823. Hodgson thus had much experience at the hospital, but, his father having fallen on evil days, owed the completion of his education to an uncle, who gave him £100. He entered St. Bartholomew's Hospital, and in 1811 gained the Jacksonian Prize for his essay on "Wounds and Diseases of the Arteries and Veins". The essay was expanded and was published in 1815 with a quarto volume of illustrative engravings from drawings made by the author. It was well received and was translated into French by M. Breschet. The drawings show that Hodgson was no mean artist. He practised at King Street, Cheapside, and eked out his scanty resources by taking pupils and acting as editor of the London Medical Review. He also served at the York Military Hospital, Westminster, where he remained for some time in comparatively comfortable pecuniary circumstances, but insufficient practice and a desire to marry his future wife, who was a sister of J. F. Ledsam, took him back to Birmingham in 1818, where he was welcomed and elected Surgeon to the Birmingham General Hospital in December, 1821, on the death of Samuel Dickenson. He soon attained a good practice, and had amongst his patients Sir Robert Peel and many members of his family, who were living at Drayton Hall, near Tamworth. Many years later - in 1850 - he was in personal attendance when the Prime Minister, who had just resigned his office, fell from his horse in Constitution Hill and received the injury which proved fatal. 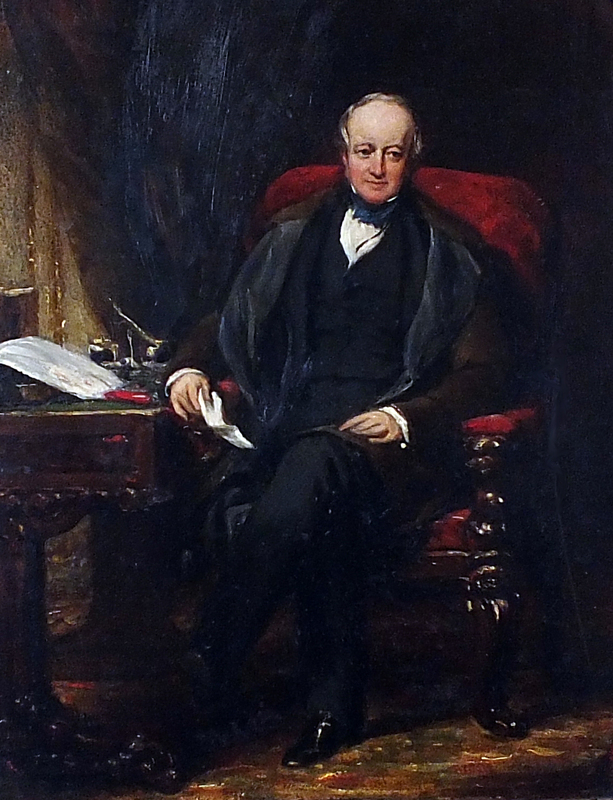 Hodgson resigned his post of Surgeon to the Hospital in April, 1848, and the Governors presented him with the portrait which now hangs in the Committee Room. In the autumn of 1823 he started a movement to establish an Eye Infirmary in Birmingham. It was successful, and the Charity was opened for the reception of patients on April 13th, 1824. He acted as sole Surgeon until May, 1828, when at his request Richard Middlemore (q.v.) was elected as his colleague. He was asked in 1840 to become Surgeon to the Middlesex Hospital and Professor of Surgery at King's College, but declined both offers. It was not until 1849, after having made a considerable fortune in Birmingham, chiefly by lithotomy, that he gave up his house in Hagley Road and returned to Westbourne Terrace, Hyde Park. He was elected a Member of the Council of the Royal College of Surgeons in 1849 and held office until 1868, being elected to the Court of Examiners, 1856-65; Chairman of the Midwifery Board, 1863; Vice-President, 1862 and 1863; and President, 1864. He delivered the Hunterian Oration in 1855. He was admitted F.R.S. on April 14th, 1831, and was President of the Medico-Chirurgical Society in 1851. He died on Feb. 7th, 1869, twenty-four hours after his wife, and left one daughter. With the exception of Joseph Swan, Joseph Hodgson was the first provincial surgeon to become a Member of the Council of the Royal College of Surgeons, and he was the first surgeon from the provinces to be elected President. He was chosen because his reputation was not confined to the locality of a country town, but was great even in London. He was not brilliant as an operator, and, like most provincial and many London surgeons his contemporaries, he acted as a family practitioner. He was celebrated for the accuracy of his diagnosis, but his caution and his pessimistic prognosis did something to limit his practice. He was a good teacher and was fortunate in his pupils; in Birmingham he taught D. W. Crompton, S. H. Amphlett, Alfred Baker, and Oliver Pemberton; in London, William Bowman and Richard Partridge. Born a Conservative, he had some lively debates with his Radical fellow-citizens, but his benevolence and kindness of manner made him respected and beloved. He was consistently opposed to all reforms and steadfastly opposed the formation of a School of Medicine in Birmingham. The presentation portrait by John Partridge, painted in 1848, was engraved by Samuel Cousins in 1849. A proof, 'for subscribers only', is in the College Collection. John Partridge worn in Glasgow, the second son of twelve children of Samuel Partridge. His brother Richard Partridge became the President of the Royal College of Surgeons; his nephew Sir John Bernard Partridge was an illustrator and actor. Partridge studied with the portrait painter Thomas Phillips from 1814; he exhibited his first painting, 'Miss Foote in the Character of Lucilla' at the Royal Academy in 1815. He moved to London the same year, entering the Royal Academy Schools in 1816. At first he lived in Marylebone, then a popular neighbourhood with artists. In 1820, he married his cousin Clementina Sarah Campbell; she features in his painting 'The artist and his family in his house at 21 Brook Street, Grosvenor Square' (c. 1828–35). From 1823 to 1827, he lived inItaly, staying in Florence, Venice, and Rome. During his time there, his focus widened from purely portraits; he sketched landscapes and made copies of Renaissance masters including Correggio, Raphael, Rubens, Tintoretto and Titian. During his stay in Italy, he gained several wealthy patrons.In 1828, soon after his return from Rome, he left Marylebone for the more upper class Brook Street, off Grosvenor Square, where many of his sitters resided. The move seems to have paid off: his career blossomed. Between 1827 and 1845, he painted over two hundred portraits, earning him £2762 in 1841 alone. Many were of prestigious sitters, including an 1836 commission from Leopold I of Belgium, which led two years later to the patronage of Queen Victoria. He painted several successful portraits of the Queen and of Prince Albert, and in 1843, he became 'portrait painter-extraordinary' to the Queen. Queen Victoria's attentions were, however, to prove fickle, and the 1842 arrival of Franz Xaver Winterhalter, soon the new favourite, cut short Partridge's career as a royal portraitist. In 1846, Partridge made the decision never to exhibit again at the Royal Academy, after two of his portraits were placed insultingly badly, probably in consequence of a dispute more than a decade earlier with fellow artist and Royal Academician,Ramsay Richard Reinagle, over Partridge altering one of Reinagle's pictures for the owner. He did not change his mind even when, two years later, Reinagle was discredited for claiming another artist's work as his own. Partridge died in London in 1872. He had earlier donated some of his unsold paintings to the National Portrait Gallery. Further donations to the NPG of his work were made in 1961 by the artists's nephew Sir Bernard Partridge. Parridge's small-scale sketches of eminent people in his immediate circle are amongst the most attractive and satisfying works of his oeuvre. 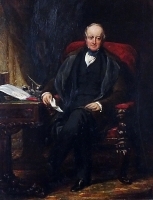 Hodgson's choice of Partridge to paint his portraits was doubtless influenced by his friendship with Richard Partridge, the artist's brother, who was President in 1866, two years after Hodgson's election as PRCS in 1864.